Artist, received his bachelor degree of Art in Jilin College of the Arts in 2006. Since 2008, he has been teaching art as a visiting lecturer. 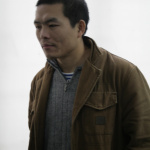 In 2009, he initiated Chengdu artistic practice organization “Art Praxis”. Currently living and working in Chengdu, China. Center (Chengdu), OrganHaus (Chongqing), A Thousand Plateaus Art Space (Chengdu), etc.. His works’ related comments have been published in Urban China, RTCO Journal, ON | OFF: Collective Practice in China 2002-2012, Leap, Echoes: Chengdu New Visual Art Documentary Exhibition 1989-2007, etc.. He has also entry Award in Melancholy in Progress—2012 Taiwan International Video Art Exhibition, and has been selected by Inward Gazes-2012 Documentaries of Chinese Performance Art, Macao, China.